Arbor Day is next Friday, April 24, 2015. To prepare, we have gathered some “tree-rific” books about trees for children. 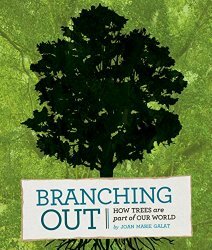 First up is Branching Out: How Trees Are Part of Our World by Joan Marie Galat and illustrated by Wendy Ding. 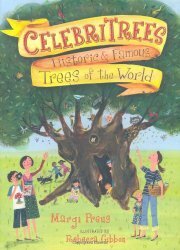 A title for middle grade readers, it investigates 11 special kinds of trees from around the world. Using four-page spreads, the author describes a particular species of tree, how it used by humans, and what animals depend on that particular kind of tree. The trees included range from red maples to pau brasil trees. Our second title is a slightly older one. Celebritrees: Historic and Famous Trees of the World (2011) by Margi Preus and illustrated by Rebecca Gibbon tells the stories of 14 famous, tall and exceptionally-old trees. Interestingly, Celebritrees is as much a discourse about human history and behavior as it is about trees. We humans are attracted to big and old trees, as well as those with unique stories or features. In fact, sometimes humans are so attracted to certain trees that by sheer numbers visitors have damaged and sometimes killed the very trees they revere. The author notes that the exact identities and locations of some of the trees has been hidden so the trees are left alone to continue their lives. Rebecca Gibbon has created lighthearted, fun illustrations using a mix of acrylic ink, colored pencils and watercolor. The illustrations allow for a more coherent look and also incorporate details of the text in ingenious ways. The look would definitely appeal to young readers who prefer fiction. Even though they have a different look and voice, both these books celebrate the importance of trees, looking at the role of trees ecologically and in the context of human society. Both have suggestions for what children can do to help trees in the back matter. Both are also sure to inspire young readers to appreciate trees! See a longer review and a book trailer at Wrapped in Foil blog. Want more choices for Arbor Day reading? Check out our giant list of children’s books about trees at Science Books for Kids. Categories: Science, STEM Friday round-up | Tags: Branching Out, Celebritrees | Permalink.